What do probiotics have to do with respiratory health? Are probiotics the answer to getting back to running? I am finally turning into a human again. It has been almost two full weeks since I came down with a horrible upper-respiratory illness. I have been so fatigued and coughing my head off and my training plan for the last two weeks went completely out the window. When I was sick I started to do a bit more research into holistic health remedies that might help to prevent or at least shorten illness. I do not tend to respond well to traditional medicine often ending up on the severe spectrum when it comes to side effects. This being the case I am often hesitant to take medicine when I am sick unless it is absolutely necessary. When I was sick, blogger Sarah Stanley asked me on twitter if I was using any probiotics to support my immune health and this got me thinking–How could probiotics (commonly found in yogurt help me with my bronchitis)? I had always thought of probiotics as something that you might use in the case of abdominal upset and difficulties with diarrhea. I did not realize the power of probiotics in overall immune support. Probiotics are live organisms that live mostly in the digestive tract and aid in the process of digesting foods. Probiotics have proven beneficial in preventing or reducing the length of respiratory illness (Source). According to the website GreenMedInfo, “The digestive tract constitutes 80% of the immune system and billions of those bacteria live there, 15% of them potentially harmful, but 85% of them beneficial to us. Keeping the good bacteria alive and active is key to not only preventing respiratory infections but lessening their severity and duration. Taking probiotics as a supplement can act as a preventative measure to protecting your overall immune health. 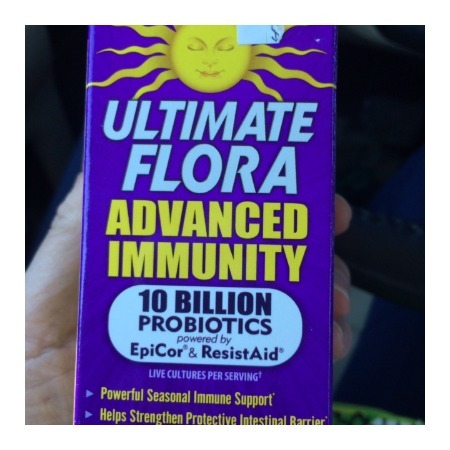 After conducting a little bit of online research I headed to my local health food store The Healthy Rhino and purchased some Ultimate Flora Advanced Immunity Probiotic Supplement to try. This sickness has been a doozy! I allowed my body to be vulnerable during my training and allowed my immune system to bog down by not giving my body the appropriate rest and nutrition that it needs to balance the demands of marathon training. Even though I am still at the tail end of my illness I am hoping that the probiotics that I am adding into my system can help to restore some order in my gut and give my immune system a boost as I head into the final stages of my Boston Marathon training. Do you use a Probiotic Supplement? I’d love to hear your thoughts on probiotics! I swear by probiotics! I currently take 50 billion by Anti Floral for vaginal health and take the Jarrow brand yellow box (the ones that don’t need to be refrigerated) for when I travel. Lora recently posted…You are my inspiration!